Hey, all you fantastic BOD members, thanks for reading! Check out this week’s author spotlight! 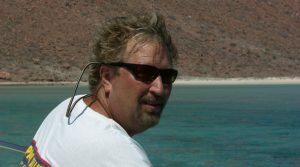 I’m very excited to interview P Mark DeBryan. Welcome! I love learning about author’s writing history. So, tell us how or when you knew writing was what you wanted to do? It all came about rather inconspicuously. I sent a short story into an author who asked for fan fiction submission. That author was John O’Brien, a favorite of mine. He chose my story for a compilation of his A New World series in Untold Stories. Soon after that, he encouraged me to expand the short story “In For a Dollar, In For a Dime” (now free on Amazon) into a full-length novel, and Family Reunion was born. When I finished writing the short story, I thought to myself, This is what I want to do. 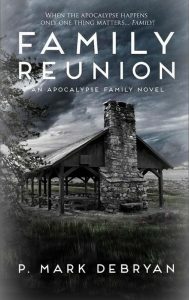 Family Reunion is such a fun take on an apocalyptic world. I especially love that all of your characters end up being family. Can you tell us more about this story and where you came up with the story? I was scheduled to head to a long overdue family reunion when I wrote the short story. I didn’t really think it would get selected for use, and I didn’t ask for permission, but I based it loosely on my family. Then by the time I went to the actual reunion, John had published it in his book and it was passed around the family. They were all okay with it, or at least they didn’t yell at me or throw things at me. The characters, while based on my family tree, are not real. I make them do things that they may or may not actually do or say. One of my sisters said, “Hey, we all understand, it’s a story; you are allowed poetic license.” The diversity of the family in the story, however, is very real. My parents raised all seven of us to be individuals, and then they were surprised when we all turned out so differently. The full spectrum of personalities of the characters in the book, and their place in the tree is about the only thing that is truly representative of reality. We fight and argue and can’t agree on the color of the sky, but don’t you dare think about getting in between us… lol. A couple of your characters, Ryan, Max, and Lisa, seem to have a pretty fair understanding of weaponry, especially of guns. Is this knowledge from your own experience with guns, or did you have to research your artillery details? A little of both, actually. I do own a few of the weapons used in the book, but others are some that I secretly covet. I guess it isn’t a secret any longer, is it? I did spend many hours trying to make sure that an informed reader would not be disappointed with my choices and use of these weapons. For instance, your use of “artillery” above would have resulted in many emails and possibly a few FB post. I did make one mistake in the identification of a particular weapon, but it was more an oversight then an outright mistake. Ted Nulty, my friend, and former Marine was nice enough to give me a heads up on it, and it was changed. If you have an early Kindle copy, you may find it. Right now, several people are searching through the book, trying to find it. Since the power of family is such a strong theme in Family Reunion, who in your family would you want to face an apocalypse with and why? Every single one of them. There are many reasons. Medical, there are several nurses in the family with decades of experience in the ER, OR, and Psychological health. Biology, there are several naturalist in the family with decades of practical experience in the wild. The character Parker is probably the best example of this. I would eat anything he handed me with confidence. Farming, there are a few professional farmers in the group and several advanced amateurs. There’s also the fact that I believe this group has very few weak links. Sound minds will be a big factor in survivability. The biggest reason, I love them and don’t want to see them get eaten; however, just being together won’t guarantee that. Oh, and Sophie… she has a really cool Motor Coach! Do you have any writing rituals that help you get in the writing groove? For example, do you have a favorite band or type of music you listen to that help you write, etc.? My mom used to have a book open, TV on, and food cooking on the stove, while singing. I, on the other hand, must have quiet. No music, no internet, no interruptions! I love music, just not while I’m writing. Typically, the wife will have to yell my name loudly three times to bring me out of my writing zone. I have started writing the second book in the series. October was dedicated pretty much to promoting Family Reunion, but in November I will step back some and write a lot more! It will pick up where Family Reunion ended without much of a jump in time. Without leaving spoilers, that is about all I can say! Where is your favorite place to read, and what kind of books are your go-to books? The Jacuzzi! Before I started writing (heavy sigh) I could disappear to the Jacuzzi and be missing for hours. Any book, any genre, doesn’t matter, as long as it is fiction. I read TIDs all day at my day job (Technical Information Documents) so no non-fiction for pleasure. Currently, I have been binge listening to Sci-fi while I commute an hour to work, and reading a detective novel before sleeping. I have a brand new grandson, so he will be my new hobby. I will have an adult beverage with friends occasionally, but strangely enough I don’t have much free time anymore. For my day job I manage a datacenter in West Virginia. Lots of blinky lights that must stay blinky in order for the world not to end and to keep “THE CLOUD” from disappearing. Now tell us some fun random facts about you. If you could go anywhere in the world, where would it be, why would you go there, and who would you go with? Hmmm, random facts. I had a crepe restaurant at seventeen. I raised a sheep in high school for 4-H his name was Beethoven. I was a three-sport letterman. I knew the Pittsburgh Pirate Parrot personally, and he got a ticket for driving with his head on when he was hurrying to meet me. I have owned three businesses throughout my life. I played bass guitar very badly for years (it was fun!). I worked as a program director for a summer camp in Wisconsin for a while. I think that is about as random as I can get. Where would I go? The South Pacific somewhere—one of the cool little huts that is out over the water. I would go with my wife and sip fruity drinks and eat copious amounts of fresh sea food and read really cool books while baking in the sun. Or maybe I’d go hang out with Larry Sullivan; he goes all over the world. Who is he? Just a favorite Facebook friend who always posts really cool pics… haha! Yeah, the South Pacific. With my family. He was a good dad. Thank you so much, P Mark DeBryan, for spending some time with us, and for sharing your talents with all of us at BOD. Mark has always been a bit of a vagabond. Born in Washington, raised in California he joined the Coast Guard after high school. His first assignment after boot camp was as the driver for the admiral of PACAREA in San Francisco. After a short stay working at a LORAN station, he went for a cruise on a 378´ cutter in the Bering Sea, then onto aviation where he was a crewman of both fixed-wing and rotary aircraft in Texas. After four years in the Coast Guard, he worked security, first guarding MX nuclear missiles, then at a nuclear power plant in California. Eventually he went to college in Wisconsin, only to drop out after meeting his future wife. He went on to finish college at 36 and own a Miracle Ear franchise. He went into publishing for a short time before becoming an information systems specialist. He currently splits his time between West (by God) Virginia and Surfside Beach, SC.